Breaking News: Santa Claus Supports Opt-Out!!! Santa Claus was getting pictures at the Dover Mall with young children. He always asks the kids what they want for Christmas. He acknowledged hearing very strange requests over the years. But he reported to me recently about a very unusual request he got on Black Friday. A little boy who was 8 years old told Santa he only wanted one thing for Christmas. He wanted his mother to opt him out of the Smarter Balanced Assessment. Santa asked the boy what “opting out” means? The boy said some parents actually told the school they didn’t want their kid taking the Smarter Balanced test. The school gave them a rough time, but the parents fought back. “If they can do it, can you make sure my mom does it too?” Santa pondered this for a moment. “I think,” Santa said, “That would be up to your Mom.” “Good, she is right over there,” the boy said and pointed to his mother. “Mom, can you come over here? Santa wants to ask you something!” the boy shouted. The boy’s mother walked over and Santa said “Your son wants you to opt him out of the Smarter something test. It’s all he wants for Christmas.” The boy’s mother explained she had never heard of the test. “That’s cause this is the first year we take it Mom. I heard some teachers say it doesn’t actually mean anything and it only lets the state know how we are doing. And I heard something about some evil Psycho Metric guy.” The boy’s mother explained, “I will have to look into this.” The boy shouted “But I want you to opt me out!” The crowd heard the words “opt-out” and all of a sudden, parents were yelling “Opt him out! Opt him out!” Santa explained how he had to get to the next kid as the line to visit him was getting longer. “Let me make some calls on this! Can I call your mom about this when I get more information?” The boy’s mother gave Santa their phone number. I am letting you know that I am opting my son out of the Smarter Balanced Assessment that will be administered in 2016. I am requesting my son not be punished for my decision and that he is given instruction while the other children are taking the test. I understand schools have to give the test, but I also know this is a parent’s right and there is no law stating I can’t. I do not wish to have any meetings or calls about this. Please respect my decision. Santa was very proud of the boy for having the courage to ask for something so simple. It gave him hope that other parents would see the wisdom in the boy and his mother’s decision. Santa doesn’t usually interfere with the workings of the people, but he thought in this case he should issue some type of proclamation about this whole opt-out thing. So he asked me to give the exclusive on his proclamation to which I happily agreed. 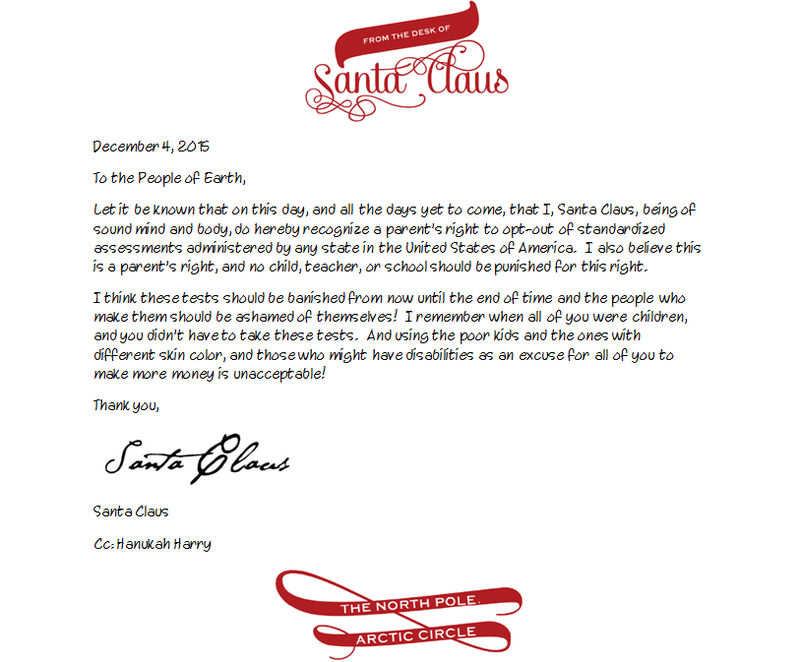 So without further ado, here is Santa’s official stance on opt-out! This entry was posted in Parent Opt-Out of the Smarter Balanced Assessment, Santa Claus and tagged AFWG, Common Core, DE Secretary of Education Godowsky, DE Senator David Sokola, DE State Rep. Earl Jaques, Delaware, Delaware DOE, Dover Mall, Governor Markell, House Bill 50, Proclamation, Santa Claus, Standardized Testing, Support, Test & Punish, The Opt-Out Boy by Kevin Ohlandt. Bookmark the permalink. Thank you for setting Santa straight… You still have time to learn bunny language to communicate the same over Easter. I emailed Peter Cottontail and he hooked me up with the Easter Bunny in late February, right before the next round of testing starts! It’s obvious. The Common Core high stakes tests are the new Grinch that doesn’t only steal Christmas but it causes five year old children stress and takes away fun and replaces it with punishment and then more punishment.